Mercadero offers high quality quinoa from Peru, certified organic by BCS Öko-Garantie GmbH. The supplying company grows quinoa on its own fields using efficient modern production methods, such as irrigation and mechanisation. This means that yields are high and production costs are low. The exporter also buys quinoa from outgrowers who are trained by the company in Good Agricultural Practices, in order to ensure uniform quality and full traceability. 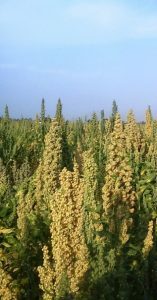 The quinoa variety cultivated by this Peruvian supplier is Salcedo INIA, which has a low level of saponin. After harvest the quinoa is transported to a HACCP certified processing plant for cleaning, packaging and storing.